Right now it is 40 degrees outside, which is no doubt warmer than PA. Still does not draw me outside to clean the workbench in the garage. I have tools scattered in the house from the unfinished bathroom project which I hope to finish this weekend. Actually for two days in a row it’s been 40 and sunny here too! Of course you only need 2 cleaned off places at the dinner table!!! Haha. Been there so many times. I have come to realize I am a “procrastinating perfectionist.” If I can’t put whatever I am putting away properly, it sits with all its friends waiting for me to get my act together. Makes for messy tables and desks. Progress in 2017? Perhaps. 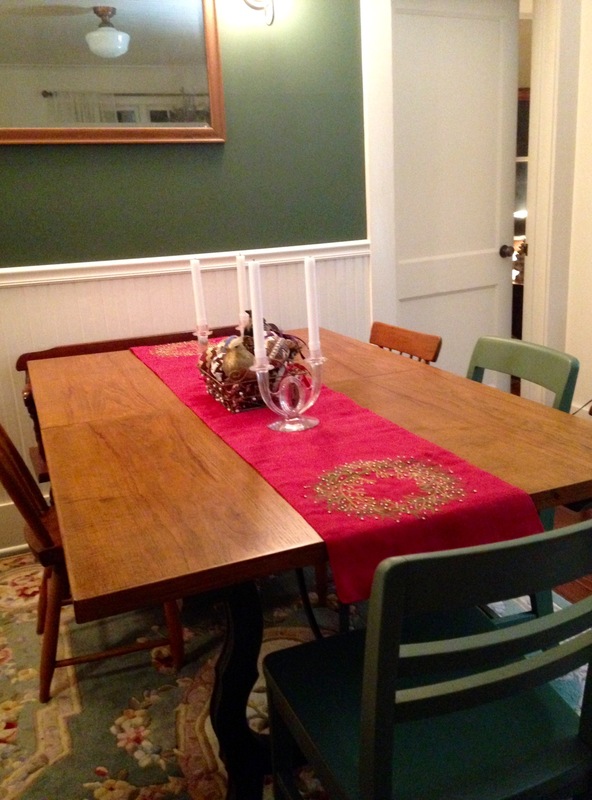 My sister — who has our old family dining table sent me a photo of it all cleaned off and pretty for Christmas, and said, This table has a long history of being messy. So I guess we get it honestly. Happy 2017! Awesome post. I love your photos too. You encourage me. Also, Organize My World sounds really overwhelming. I am working on Putting My Priorities In Order so that this activity involves only me and not the things I cannot control and also figuring out how to mop my kitchen. I enjoyed reading your post. You included one of my favorite quotes from the book. I loved the idea of spiritual gardening. I included it in my post “5 Quotes Worth Sharing from “Ordering Your Private World” by Gordon MacDonald.” I just finished reading Ordering your Private World by Gordon MacDonald and it has really revolutionized my health and life. While my dining room table is clean [only because my wife is always on top of this and has a more organized private world]. I felt that my life was out of control and that my health was spiraling downward because of it. As a means of trying to put some of the things he suggested into practice [i.e. The Knowledge & Wisdom Sector] I am starting to write to process what I am reading. Will definitely look at this. Waiting to reply until I have time to spend on it. Will get back to you soon. Thanks. It is wonderful when a book inspires us like that, isn’t it? And I’ve discovered that when I write things down I process them better as well. Plus, then we have notes to go back to! Thanks for reading and commenting.